Beauty Salon Equipment and Supplies. Indulge your Salon clients with a bit of luxury by providing them with a moist Hot Towel. These Hot Cabis will give you the means do so and they'll remember you for it. 11 litre volume. Single removable shelf inside. Heats to 70 - 80°C. Detachable drip tray. Great Hot Towel caddy. Size: External: 41 x 32 x 25.5 cm (L*W*H). Internal: 33 x 23 x 14.5 cm (L*W*H). Price: $260.00 Add to cart. 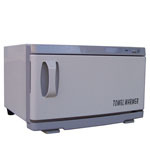 Hot Towel Cabinet with UV steriliser. 11 litre volume. Single removable shelf inside. 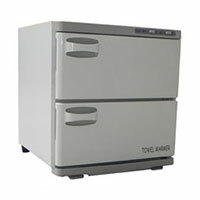 Heats to 70 - 80°C. Detachable drip tray. Includes UV globe. Separate power and UV (ultraviolet) switches. Suitable as a Barber Towel Warmer. Price: $365.00 Add to cart. The capacity of this one door Hot Cabi is 12 litres. 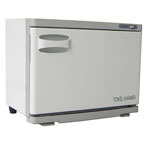 It has 2 removable shelves inside and heats to approximately 80°C. Detachable drip tray. Door opens from left to right. 18 litre capacity. Two removable shelves inside. Heats to approximately 80°C. 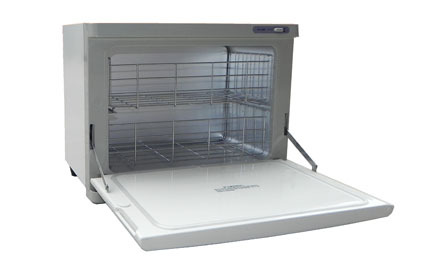 Detachable drip tray to collect excess water. Door opens left to right. Size: External: 45 x 28.5 x 35 cm (L*W*H). Internal: 37 x 19.5 x 25 cm (L*W*H). Price: $335.00 Add to cart. 18 litre capacity. Two removable shelves inside. Heats to approximately 80°C. Detachable drip tray. Cabinet door opens top to bottom. 2 x 15 litre volume. This 2 door Hot Towel rack heats to 70 - 80°C and comprises a single shelf in each compartment. Individual power buttons. 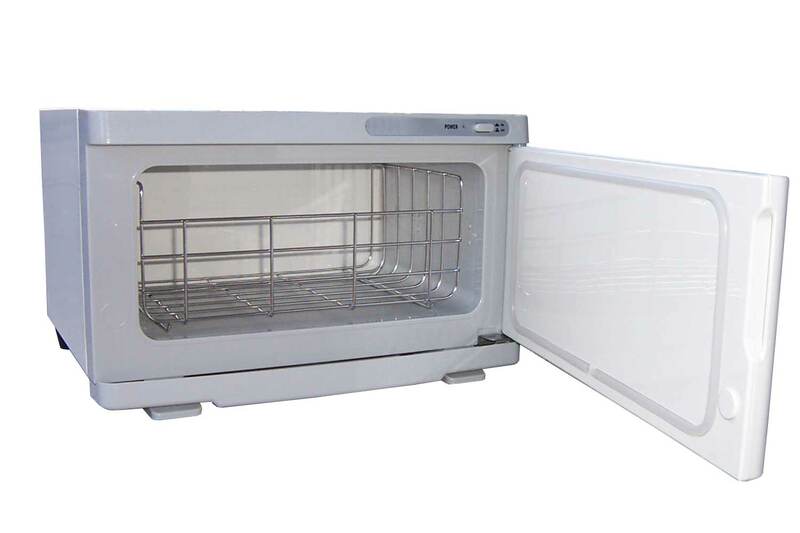 Separate drip tray for easy cleaning. Price: $495.00 Add to cart. 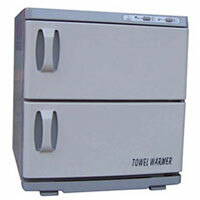 Twin Hot Towel Warmers for Massage therapy. 2 x 16 litre volume. 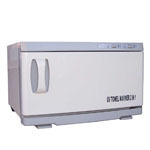 These popular Massage Towel Warmers heat to 65 - 80°C and have a single shelf inside. Detachable drip tray. Separate power switches for each Cabi. 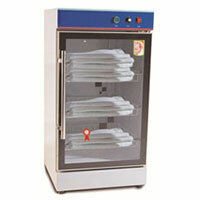 Large spa / Massage Towel Warmer Cabinet. 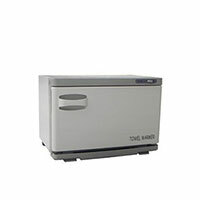 82 litre capacity. Sanitises using ultraviolet light. 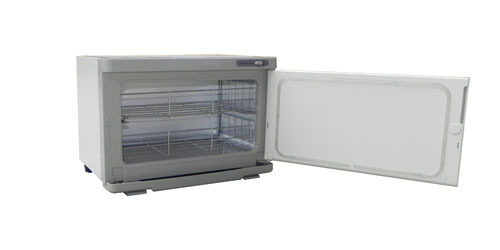 Temperature control allows adjustment to 88°C. 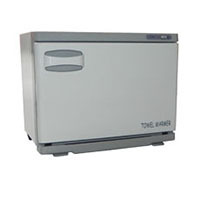 This Hot Towel Cabinet has three fixed shelves and a thin stainless steel external casing. 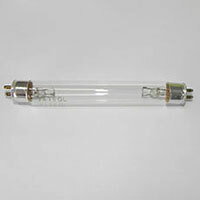 Replacement UV globes for the CAPH008. 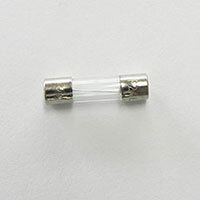 The current model uses a screw in type bulb - 5 cm (length), 1.5 cm (width) - 3 watt. Price: $16.00 Add to cart. 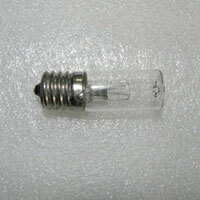 Some earlier models used the F4T5/GL bulb - 12.5 cm (length) - 4 watt. Packs of 8 available in white. Size: 35 x 35 cm (approx).